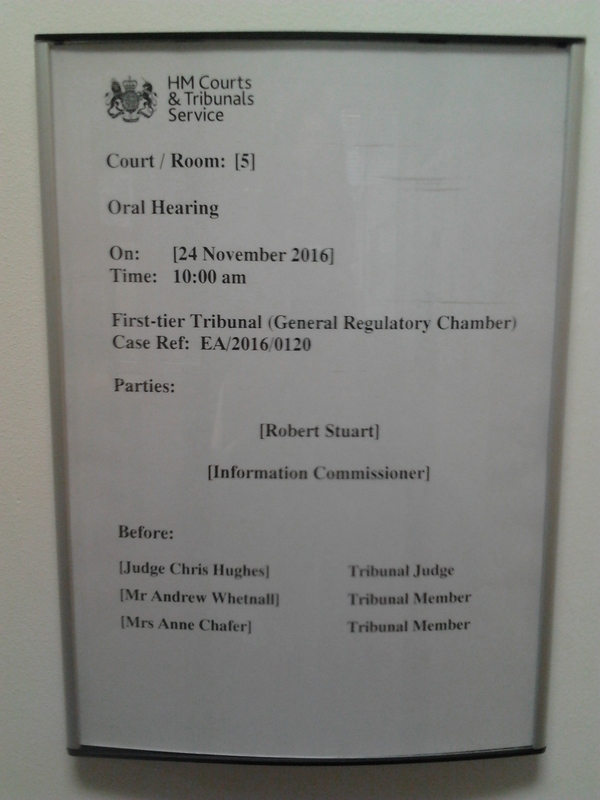 Following a hearing on 24 November 2016 the First-tier Tribunal (General Regulatory Chamber) has dismissed my appeal against the decision of the Information Commissioner’s Office (ICO) to uphold the BBC’s rejection of my Freedom of Information request for material relating to the September 2013 BBC One Panorama programme ‘Saving Syria’s Children’. The text of the Tribunal’s decision is reproduced below. A number of links are embedded for reference. A copy of the original decision is here (PDF). 1. The Appellant in these proceedings is critical of the journalistic standards of the BBC in relation to a BBC One Panorama programme broadcast in 2013 “Saving Syria’s Children” (“SSC”). 2. He pursued a complaint through the BBC processes and was dissatisfied with the outcome; he told the tribunal that the BBC disagreed “without addressing many of my points“. 3. All internal BBC communications, documents and reports pertaining to complaints made by myself and others about SSC and related BBC News reports…..
5. All footage and still images shot by members of the SSC team….. The information you have requested is excluded from the Act because it is held for the purposes of “journalism, art or literature”. The BBC is therefore not obliged to provide this information to you and will not be doing so on this occasion. Part VI of Schedule 1 to FOIA provides that information held by the BBC and the other public service broadcasters is only covered by the Act if it is held for “purposes other than those of journalism, art or literature”. The BBC is not required to supply information held for the purposes of creating the BBC’s output or information that supports and is closely associated with these creative activities. 5. The Appellant complained to the Respondent Information Commissioner (“ICO”) on 11 February 2016 about the refusal. In that complaint he indicated that he had complained to the Metropolitan Police and he complained that the BBC had contravened Article 20 of the International Covenant on Civil and Political Rights (“ICCPR”) which prohibits propaganda for war and advocacy of national, racial or religious hatred. ‘journalism, art or literature’ seems to be intended to cover the whole of the BBCs output in its mission (under article 5 of its Royal Charter) to inform, educate and entertain the public. On that comprehensive approach the purposes of journalism, art or literature would be, quite simply, the purposes of the BBC’s entire output to the public. 7. The Appellant repeated his claim with respect to the ICCPR and asked that the ICO proceed to a decision notice. 16 The Commissioner considers that the requested information is directly related to the BBC’s output as it relates to planning and production of a programme that was aired on the BBC in September 2013. In particular it relates to the gathering and collecting of material for broadcast and any reviews of the standards and quality of the production on the back of any complaints received. 18 The Commissioner has therefore found that the request is for information held for the purposes of journalism and that the BBC was not obliged to comply with Parts I to V of the Act. 10. The Registrar in a Case Management Note of 3 May explained the Tribunal’s power and jurisdiction which was limited to deciding whether the decision notice was in accordance with the law and the tribunal was unable to grant him a remedy with respect to his claim of breach of the ICCPR. She further explained that he had not provided grounds for appeal which explained why he considered the ICO was “wrong in law i.e. the ICO was wrong to conclude that the information was held for the purposes of journalism, art or literature.” She directed that he provide “any reasons that he says the information he sought was/is not held by the BBC for purposes of journalism, art or literature”. Despite this clear instruction the Appellant failed to comply with this requirement. He placed the Case Management Note on the internet without permission and was directed by the Tribunal to remove it. 12. The ICO resisted the appeal and set out a detailed exposition of the law in the light of the binding decision of the Supreme Court in Sugar. 13. In the Tribunal the Appellant agreed that he was concerned with journalistic standards. It was clear that he had not turned his mind to the contents of the Case Management Note directing him to explain why he said that the information was not held for the purposes of journalism, art or literature, nor had he engaged with the explanations put forward successively by the BBC and the ICO. He was unable to assist the Tribunal with any arguments why the material was not held for the purposes of journalism, merely his strongly held belief that the material was not genuine. He was unable to grasp or explain the fundamental flaw at the heart of his appeal, that having complained about standards of journalism of the BBC (indeed articulating that concern at the start of the hearing) and pursued the BBC complaints process with respect to these standards, he now argued that a news and current affairs programme was not journalism. 14. The difficulty the Tribunal faces with that argument is that it is [sic] does not have the jurisdiction to review the standards of journalism of the BBC or consider how the BBC has handled his complaint about standards, those responsibilities lie primarily with the BBC Trust, certainly not with this Tribunal. The decision in Sugar (see paragraph 6 above) is quite clear, the exemption covers the whole of the BBC’s output, whether it is broadcast to “inform, educate and entertain” (BBC Charter) and whether it is categorised as journalism, art or literature” (FOIA), the Tribunal is not in a position to order its disclosure. 15. At no stage has the Appellant advanced any argument to show why the ICO was wrong in law. The law is very clear. The BBC’s status under FOIA recognises the importance of the freedom to communicate and express and receive ideas and information which is enshrined in Article 10 of the European Convention on Human Rights and FOIA excludes such material from its regime in order to protect journalism and art from state control. The broadcast and associated material are held for the purposes of journalism. This appeal is without foundation and is dismissed. 16. Our decision is unanimous.